I love experimenting in the kitchen with natural beauty products. Not only can you come up with some great recipes, but you can reduce food waste too! Over ripe fruits can make the perfect base for a face pack. And by making your own beauty products, you don’t need to worry about nasty chemicals. With summer around the corner, we all want our hair to be looking strong and healthy. Here are some of my favourite hair conditioners – all made from natural kitchen ingredients! For dry hair, mix one egg, one tsp of honey and two tsps of olive oil together. Apply to the ends of your damp hair, wrap in a towel and leave for half an hour before shampooing. Another great remedy for dry hair is avocado. Mash an avocado, mix with a tsp of jojoba oil and work it through your dry hair. Shampoo out half an hour later. Rub natural yogurt, mixed with a couple of drops of rosemary essential oil into your scalp a couple of times a week. Spend time enjoying a head massage while you work these effective ingredients in. Shampoo your hair as normal afterwards. After shampooing, use a cider vinegar rinse. Put 1 tbsp cider vinegar into a jug and top up with 1 litre warm water. Pour through the hair after shampooing and don’t rinse. To help balance oily hair reduce your use of harsh shampoos. Switch to a more gentle brand and avoid those which strip your hair. Try John Masters lavender and rosemary shampoo, or even a children’s shampoo such as Green people. 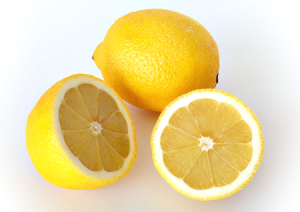 After shampooing and conditioning (only apply a tiny amount of conditioner to the ends of your hair if it is oily), squeeze the juice of one lemon into a litre of warm water and pour it through your hair as a rinse. What about you? Do you have a favourite, natural treat for you hair? These are some great recipes! They certainly beat spending money on products that don’t work. Hi McGreenGal; thanks for stopping by and leaving a comment. I’m glad you like the simple recipes. I love taking the things mother nature provides, which are often much more effective than expensive things in plastic bottles! I love the Green StudentU site – is that your own site? Love these! I absolutely adore mixing up my own beauty products too. It is so comforting to really know what is in something that you are putting all over your children or yourself. Thanks for the recipes! @Wendy: Hi Wendy, I’m glad you like the recipe ideas. Do you have a favourite product that you make at home? I have found here useful information. Thank you! @herbal shampoo: You’re welcome; glad it was helpful. What type of hair do you have and do you have any favourite home made recipes to share with us? I am concerned about parabens and chemicals so I use the Made from Earth Peppermint conditioner as a substitute for many things in the shower. I use this instead of shaving creams always, my legs, and arm pits are grateful. I am big on exfoliating and in winter after I shower, I add baking soda to the Made from Earth conditioner and apply it all over my body in a circular motion (paying attention to elbows, knees, hands, and feet) then do my final rinse. I do this once a week and I follow with shea butter or Extra Virgin Olive oil and this keeps my extra dry winter skin super soft, without chemicals and parabens. And it smells great, so no need for body sprays afterwards. @mark k: Hello Mark, thanks for your comment and for the product recommendation. I agree with you that less is more and if we can double up one product as multi-use that is great. You might have read previously that I have used clay before – you can use that on face, body and hair and it does away with the need for conditioner or moisturisers. It sounds like you have a great regime there and gorgeous skin!